As a collector of many things, as detailed here, I’ve acquired art that has specific meaning to me: a Glen E. Friedman Dog Town-era Tony Alva photo from 1977, a 1960s Laguna Beach oil painting by George Michaud that hung in my house as a kid, and some amazing “found” surf photos and paintings I always discovered while looking for other stuff, mostly vintage furniture and car parts. So buying what I love came naturally, because I only picked up and kept stuff along the way that I really like. You may have gotten from earlier posts that I am a bit nostalgic, especially around things surf and South Bay. Growing up in Manhattan Beach in the ’70s was a different time. Manhattan had yet to become the “disco” beach suburb that, I regret to say, it has become. People lived here because they loved the beach, surf, and volleyball. A small-town vibe where teachers, lifeguards and firemen could afford to live in the town where the worked and served their neighbors. Those days are gone. During the late 1970s and early ‘80s, L.A. boasted a well documented punk music scene, and I was lucky enough to see many great shows at various venue: The Police, 1979, at both the Whisky and Hollywood Park racetrack, all the major ska bands at the Whisky and, a week of Clash shows at the Hollywood Palladium. The South Bay had its own scene, defined by local bands Black Flag and the Circle Jerks. The Black Flag ethos was defined a relentless beat, Henry Rollins’s vocals and Raymond Pettibon concert flyers and album art. 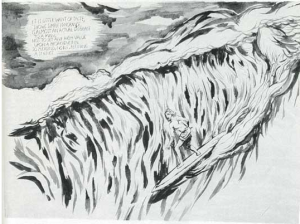 As the brother of Black Flag founder, Mike Ginn, Pettibon’s monochromatic, anti-authoritarian style became synonymous with the band. This recognition allowed Pettibon, who still lives in Hermosa Beach, to begin an art career in earnest–to amazing success. 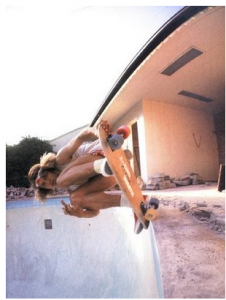 While some of his images and subject matter are provocative, his surf imagery is truly without equal. 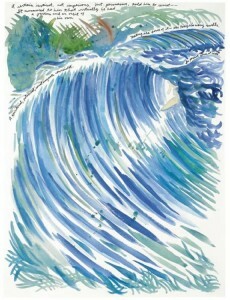 While Surfer Magazine founder and artist, John Severson, defined the “wave” aesthetic in the 1960s, Pettibon’s perfect barrels, and use of subtle and not so subtle coloring, has earned him an international following of surfers, museums and serious art collectors. This lead not only to amazing accolades, but a Whitney Biennial exhibition in 2004, along with a Bucksbaum award. Not all of these are surf images, in fact, most aren’t. But these are the paintings and drawings that I have lusted after. 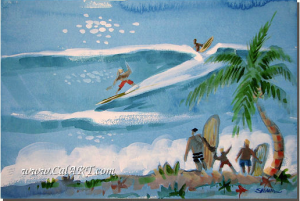 I follow the major auction houses (Phillips, Christies, Sotheby’s) closely, and am always on the hunt for a surf picture that I can afford. There are a couple of non-surf monochromatic pieces in next week’s Phillips contemporary art sale. 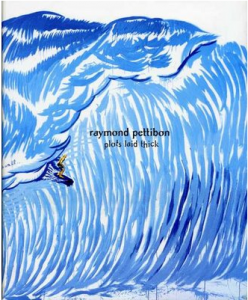 There are also some great Pettibon books, Plots Laid Thick, is a favorite. 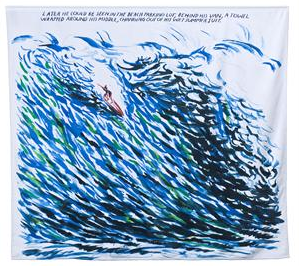 Although it sounds weird, there is also a very cool Pettibon beach towel, part of an amazing artists series. I’ve gotten lucky over the years, and picked up some good examples, at prices I could afford. With too many interests, and too little time, I’ve had to edit my collections, staying focused, and after years of searching, Pettibon’s have made it into the collection. Buying what I love has been the filter. Another great post. I have often looked at art and agree that you should just buy what you like. My life has not yet gotten me to collecting art, but I do follow that philosophy with my surfboards. I see something that really jumps out at me, I usually grab the board, ride it like crazy for a year and then either keep it as part of the permanent collection or pass it on to someone else.